Limo Hire For Corporate Transfers – Travel In Comfort And Luxury! The corporate transfer is certainly a different type of travel that needs meticulous planning. The corporate executives prefer travelling in a luxurious vehicle that features all the desired amenities. Limousines are the only vehicles that can create the right impression for your business and create the best atmosphere for your clients. The charm and lively ambience inside of the limousine is unparalleled that any traveller would like to enjoy. If you are willing to give a pleasant greeting to your business clients, then why don’t you arrange limo hire services to pick them up from the Melbourne airport? Comfort, entertainment, communication facilities and security are the basic requirements of corporate transfer. At Exclusive Limousines, we provide a complete range of limo rental services together with the perfect combination of advanced amenities and facilities. We deliver high-end services to our corporate customers in accordance with international standards. Exclusive Limousines has a large range of well-equipped limousines, hummers, stretch limousines and classic vehicles to choose from. 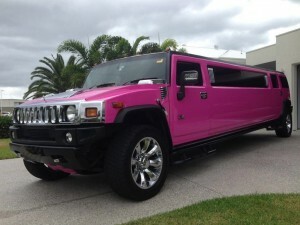 We also have a hot pink limo that is perfect for any casual meeting. With numerous options available, you can choose the limo based on the number of clients that you want to transport. Whether you want a limo for a small group or a larger one, Exclusive Limousines can fulfil your needs. We have a team of well-trained chauffeurs who strictly adhere to your schedule and treat your clients in a professional manner. Our chauffeurs are prompt, discreet and courteous and they prioritise the safety and privacy of your business clients to make them happy and satisfied. With our hummer hire services, you can take complete advantage of the plush leather interior, spacious leg room and air conditioning system to travel in utmost comfort. We also have vehicles integrated with flat TVs, entertainment systems, dancing floors, full-equipped bars and many other facilities that your clients can take pleasure in throughout the trip. The interior of our vehicles is spacious enough to have a small meeting with your clients on the move. With our stretch hummer hire services, you can enjoy the ideal opportunity of relaxing and focusing on other important activities on the move. Want limo hire for corporate transfers? Give us a call today!